By J. M. Winterbottom, B.Sc., Ph.D., Department of Native Education, Northern Rhodesia Aug, 1937. The rival claims of Mpezeni and Umbelwa to the paramountcy of the Angoni have never been decided to the satisfaction of those who are most deeply interested in the matter- the Angoni themselves. Thanks to the work of Dr. Elmslie,1 Dr Fraser2 and the Rev. T. Cullen Young,3 the history of Umbelwa's section of this tribe, and, with it, his claims to the chieftainship, are pretty well known and even Mr. Lane Poole4 has been content to follow them in his account of the tribe. The credit for unravelling Mpezeni's claim belongs to Mr. D. G. Lancaster, whose paper (in the press) on chronology and genealogy I have been privileged to see in manuscript. 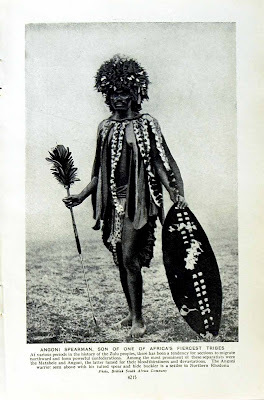 The story is told, from Umbelwa's point of view, simply and sufficiently in Midauko, a vernacular book published by the Livingstonia Mission (1933, pp. 135-136); and from Mpezeni's view- point in Maikol Jere's unpublished account, for which I am indebted to Mr. L. B. van der Walt, of the Dutch Reformed Church Mission, Tamanda, at which station Maikol Jere is an evangelist. The chief wife (gogo) of Zwangendaba was Loziwawa Nqumayo, who was a sister of Zwide. She was barren and the chief, following a well- known custom, took her sister Sosera to raise children for the house. Such a wife is known as an nhlanzi. Mpezeni Ntutu was the son of Sosera. Zwangendaba's second wife (Lusungulu) was Lomagazi Jere, in whose house there was also an nhlanzi. The latter bore Mtwalu. Later, Lomagazi herself bore a son, Umbelwa. These are the three men concerned in the paramountcy dispute. Before the birth of Mpezeni, the people of loziwawa's village, Emvuviyeni, brewed some beer and sent a pot of it to the chief. Zwangendaba, however, found extraneous matter in the beer-a hair in the Livingstonia account,5 'something unmentionable' according to Maikol Jere. Highly incensed, Zwangendaba sent people to wipe out the village. The ndunas, however, finding Sosera pregnant, hid her and, later, her son, the future Mpezeni. On the presentation of this child to the chief, he was appeased. The crux of the matter, however, lies in Zwangendaba's actions after the slaying. According to the Umbelwa version, the chief was not sufficiently softened to restore the child to his rightful position as heir apparent. In the Mpezeni version, Ntutu was not presented to his father for some years and did not lose his rights. Naturally, during the interim, the heir-apparentcy would pass to the house of the lusungulu, that of the gogo being supposed extinct. The hair, according to 'Midauko,' was taken by Zwangen- daba to be an attempt to bewitch him; but 'something unmentionable,' while it might be supposed to rouse the chief to a fit of fury at the disrespect and carelessness it presupposed, would not cause the deep and lasting resentment that an attempt at witchcraft would bring about. It is probably impossible now to get the truth, but it might be worth while showing how subsequent events are to be reconciled with the two accounts. If we assume the truth of Umbelwa's contentions, we can readily believe that Mpezeni would not be willing to resign his claims after his father's death and the quarrel between Zwangendaba's brother, Ntabene, and Lomagazi (a quarrel also due to a charge, made by the latter against the former, of trying to bewitch the chief), would give him a powerful supporter amongst the ndunas. If, on the other hand, we take Mpezeni's account to be true, the claims of Umbelwa remain understandable. Those who, during the interval when Ntutu's existence was hidden, had paid court to the house of the lusungulu, would naturally be reluctant to change over to support a newcomer. Many of those implicated in the destruction of Emvuviyeni, too, would be apprehensive that, if Mpezeni assumed the paramountcy, he would take his revenge upon them; and according to Maikol Jere's account, he was himself indiscreet enough to hint as much to Mgayi6 before he was fairly in the saddle. There remains only to weigh the probabilities. There are two or three rather suspicious points in the Umbelwa version, notably the account of how, in a time of hunger after the departure of Ntabene and the death of Mgayi, Mpezeni was asked to lead the whole tribe to a new country. The right of Zwangendaba to nominate his heir, and to pass over the gogo's house on an unproved charge of witchcraft, may also be queried. The weakness of Mpezeni's story is the extraordinary fury aroused in Zwangendaba by an apparently trivial event. I confess, however, that it seems to me that the balance of probability is in his favour. As between Mtwalu and Umbelwa, Cullen Young states that the former's onset of puberty was delayed, whereas Umbelwa came of age at a lucky time. The most usual version current among the Natives is that Mtwalu, as son of the nhlanzi, voluntarily gave way to the son of the lusungulu herself. There can be no doubt that Mpezeni lacked his father's genius for leadership; his failure to seize the opportunity to rally the whole tribe behind him, a failure to which reference has already been made, is one example, and the defection of his nduna Chiwele, who first refused to accompany him to Mpinduka and then to rejoin him when he moved to Chiposa, is another.7 But Mpezeni's defects as a leader are far less marked than those of Umbelwa. The latter started his career with a severe defeat at the hands of his father's nduna Zulu Gama, allied with Mgabi; then followed the revolt of the Atonga, who defeated the punitive expedition sent against them and made good their independence. The revolts of the Ahenga and Batumbuka, though avenged, still further re-duced the number of Umbelwa's subjects and there was also an humiliating defeat at the hands of Mwase Kasungu. A long series of bickerings between Umbelwa and one of his war leaders, Pikamalaza, resulted in the latter and his superior, Magodi Ndhlovu, crossing the watershed into what is now Northern Rhodesia in order to put themselves beyond Umbelwa's jurisdiction. Mphamba, a minor Tumbuka chief, took himself off and settled in the country of the Chewa Zumwanda, himself a chief of no great importance, without, apparently, Umbelwa being able to do anything about it.8 The drift from Umbelwa is still going on to-day and it may be doubted if this chief would still be a figure of great importance, had he not been supported by the European Administration on account of his historical position. 1.W W. A. Elmslie, Among the Wild Angoni, 1899. 2 D. Fraser, Winning a Primitive People, 1922. 3 T. Cullen-Young, Notes of the History of the Tumbuka- Kamanga People, 1933. 4 E. H. Lane Poole, Notes on the History of the Tribes of the East Luangwa Province of Northern Rhodesia, 1934. 5 This implied an attempt to bewitch him. 7 Mpezeni did send a punitive expedition, but it lost its way, and was annihilated by Gomane. 8 I am indebted to Mr. F. B. Macrae, District Commissioner, Lundazi, for this piece of information, which he obtained from the District Note-book and subsequently checked.